You are all set! Enjoy the unlimited plan now! Porting in or transferring number will remove the month plan credit. Unlimited Nationwide Talk, Text & Data - First 5GB at up to 4G LTE then the rest unlimited data at regular speed. NANO, MICRO, STANDARD ALL IN ONE. Credit 15 Krona, as the pictuer. This SIM card will not work in a Verizon-only or Sprint-only phone. The SIM card is a triple-cut SIM card (standard, micro and nano in one). Just push out the SIM size you need for your phone. PREFUNDED: 6GB data + Unlimited calls/sms USA / abroad! Size: Trio sized sim card. Standard, Micro and Nano. If your phone takes Standard size sim then take whole sim card. If you phone take Micro sim then take Micro sim card and if your phone take Nano size sim then take Nano sim card which is Pre-cut. This Trio card contains standard, micro and nano sized SIM cards. Contains no prepaid credit. 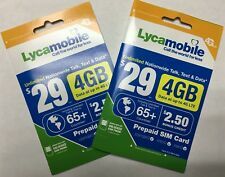 Lot 200 LYCAMOBILE PLUS TRIO LYCA MOBILE SIM CARD NANO MICRO STANDARD. Note: You are purchasing sim card only. (DO NOT THROW AWAY. Nano, Micro, and Standard. 1) Insert sim. Worldwide roaming available with this sim card. With any international and national plans! This is a 2 in 1 sim which will fit in any GSM phoneS WHICH IS REQUIES standard, micro SIM SIZE. This Trio card contains standard, micro and nano sized SIM cards. To apply your prepaid credit, enter 131 PIN# then press send, or Dial 321 (or 92#) and follow the instructions. 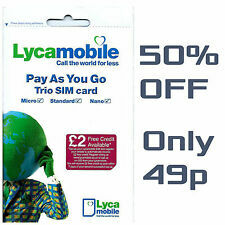 · Trio sized (3 in 1) SIM card. Standard, Micro and Nano. Free ejector PIN. 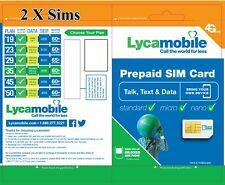 Lot 100 LYCAMOBILE PLUS TRIO LYCA MOBILE SIM CARD NANO MICRO STANDARD. Unlimited international talk and text to 60 countries. 10 sim cards per order. Unlimited Nationwide Talk, Text & Data. BEST SERVICE OF PREPAID NUMBERS FOR PORT . This item is a digital number to be ported.